This log is going to be relatively short and sweet as it did not involve any tornadoes, but it did involve a beautiful storm around 20 miles northeast of Denver, CO.Our group consisting of guests and guides for Silver Lining Tours left Lamar, CO by late morning and traveled north and west to intercept an intense storm that had already fired over Denver by early afternoon and was moving over the airport.Before we intercepted, the storm produced several landspout tornadoes as well as a funnel directly over the Denver International Airport.We intercepted the supercell northeast of the airport and observed the storm for several hours in this area as it was only moving northeast at 10 mph.Several lowerings and wall clouds were observed during this time and even a period of rapid condensation/rising motion where we all thought the storm was going to produce a tornado right in front of us.Even though the storm was tornado warned several times, this storm just could not get things together and drop a tornado but it did have beautiful structure, having a “mothership” appearance much of the duration of the storm and, at one point, a soda can appearance as the storm had a twisted look to the updraft.In addition, we experienced large hail to around ping pong ball size and some stones even larger as we let the hail core come overhead on a couple of occasions.Towards evening, we bailed on the northern storm as another was looking strong and coming at us from the south.This cell ended up dying as we intercepted near Strasburg, CO so we ended the chase here after taking pictures of an amazing sunset as more storms fired to our west over Denver. 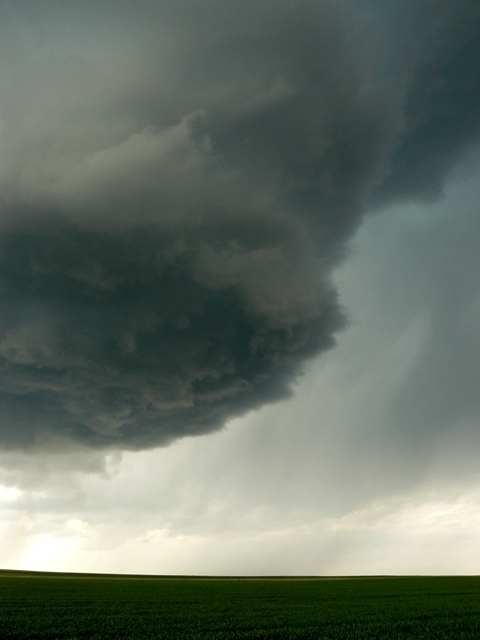 View of supercell over Denver as we are approaching from the east on I-70. Rapidly rising motion into wall cloud northeast of Denver International Airport. Continued rapid rising motion and rotation on lowering northeast of Denver International Airport. Incredible soda can appearance to this supercell. Another storm firing on the mountains near Denver at sunset. Another view of the developing storm at sunset.